Clinical and Translational Postdoctoral Fellow, Biobehavioral Branch, National Institute of Nursing Research, National Institutes of Health, Bethesda, Md. PhD, Oregon Health & Science University, Portland, Ore.
BSN, Sacred Heart University, Fairfield, Conn. Examined the impact illness perceptions and catastrophizing coping style had on quality of life in adults with irritable bowel syndrome. Dr. Sherwin was the first Clinical and Translational Postdoctoral Fellow in the National Institute of Nursing Research at National Institutes of Health in Bethesda, Maryland. Her project focused on mechanisms involved in symptom distress related to digestive disorders with a specific focus on bio-behavioral determinants that impact patients’ symptom severity. Dr. Sherwin conducts clinical research focused on symptom science and the improvement of health and symptom-related outcomes in those who suffer from chronic gastrointestinal disorders across the lifespan. Dr. LeeAnne Sherwin’s professional nursing career has spanned about three decades. Her early career experience included Med/Surg floor nursing, emergency room, recovery room, outpatient day surgery and endoscopy. She also has experience with management in a small community hospital and specialized as an ostomy nurse and diabetic nurse educator. Dr. Sherwin spent more than 10 years working as a nurse in a hospital. She then embraced the challenges of an advanced nursing degree and became a Family Nurse Practitioner with a focus in gastrointestinal disorders. During LeeAnne’s time working in a private practice in New Haven, Connecticut, she became the Assistant Director of the Liver Center and the lead facilitator of a Hepatitis C Support group. 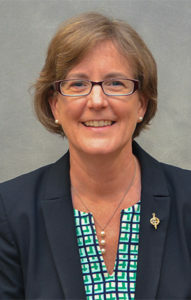 Dr. Sherwin also was an investigator at the Medical Research Center of Connecticut where her love of research was sparked. After eight years of private advanced practice, she once again embraced the challenges of an advanced nursing degree and successfully completed her PhD. To hone her research and management skills even further, she completed her Clinical and Translational Postdoctoral Fellowship at the National Institute of Nursing Research, National Institutes of Health in Bethesda, Maryland. Dr. Serwin’s current research focus is on evaluation and management of symptoms in order to reduce their impact on health and well-being. Sherwin, LB, Leary, E, & Henderson, WA. (2017). The association of catastrophizing with quality of life outcomes in patients with irritable bowel syndrome. Quality of Life Research, 26(8), 2161-2170. DOI: 10.1007/s11136-017-1554-0. Epub: March 21, 2017. Abey, SK, Yuana, Y, Kenea, ND, Joseph, PV, Fourie, NH, Sherwin, LB, Gonye, GE, Smyser, PA, Stempinski, ES, Boulineaux, CM, & Henderson, WA. (2017). Lysozyme association with circulating RNA, extracellular vesicles and chronic stress. BBA Clinical 7, 23-35. Sherwin, LB, Leary, E, & Henderson, WA (2016). Effect of illness representations of catastrophizing on quality of life in adults with irritable bowel syndrome. Journal of Psychosocial Nursing and Mental Health Services, 54(9), 44-53. Fourie, NH, Peace, RM, Abey, SK, Sherwin, LB, Wiley, JW, & Henderson, WA. (2016). Perturbations of Circulating miRNAs in Irritable Bowel Syndrome Detected Using a Multiplexed High-throughput Gene Expression Platform. J. Vis. Exp. (117), e54693, DOI: 10.3791/54693. Del Valle-Pinero AY, Sherwin LB, Anderson EM, Caudle RM & Henderson WA, (2015). Altered Vasoactive Intestinal Peptide (VIP) Expression in Both Patients with Irritable Bowel Syndrome (IBS) and Rats with Trinitrobenzene Sulfonic Acid (TNBS) Induced Colitis. World Journal of Gastroenterology, 21(1), 155-163. Fourie N, Peace R, Abey S, Sherwin LB, Rahim-Williams B, Smyser P, Wiley J, & Henderson W, (2014). Elevated miR-150 and miR-342-3p in patients with irritable bowel syndrome. Experimental & Molecular Pathology, 96, 422-425. Sherwin LB, (2015). Factors that Influence Symptom Severity in Gastrointestinal Disorders. University of Massachusetts-Amherst. Amherst, Massachusetts. Sherwin LB, (2015). Psychosocial Influences of Gastrointestinal Disorders. University of Virginia-Charlottesville. Charlottesville, Virginia. Sherwin LB, Fourie, NH, Abey, SK, Rahim-Williams, Smyser, PA, Wu, X, Sun, D, Henderson, WA. (2014). Lysozyme, Microbial Translocation and Symptom Severity in Irritable Bowel Syndrome. National Institutes of Health. Bethesda, Maryland. Sherwin, LB, (2014). Illness Representations as Predictors of Pain in Adults with Irritable Bowel Syndrome. The 9th Annual NIH Pain Consortium Symposium on Advances in Pain Research. Bethesda, Maryland. Sherwin, LB, (2013). Coping Mediates Personal Control & Quality of Life Relationship in Adults with Irritable Bowel Syndrome. National Institutes of Health, Bethesda, Maryland. Sherwin, L, (2013). Health-care providers be aware, our patients’ perceptions really matter. University of Missouri, Columbia, MO. Sherwin, L. The importance of nursing research. University of Missouri. Columbia, Missouri. Sherwin L, (2013). Illness Representation, Catastrophizing and Health-related Quality of Life in Adults with Irritable Bowel Syndrome. Oregon Health and Science University, Portland, Oregon. Sherwin, L. (2013). Mis-match of symptoms in adults with irritable bowel syndrome. Idaho State University, Pocatello, Idaho.